It’s one of the great joys of summer: splashing in a clear, cool river on a hot, hazy day. At the advent of the season, when kids can almost taste the freedom of school’s final release and ice cream shops are readying for customers, regional publications put out their lists of favorite swimming holes – the most secret, most scenic, most secluded ones. Yankee magazine has done a swimming hole list. New Hampshire magazine has, too. Heck, even the BBC published a short list of Vermont swimming holes a few years ago. There are entire websites and Facebook pages dedicated solely to swimming holes. I guess some people are well-traveled connoisseurs of these refreshing summer haunts, but I like the old familiar ones best. 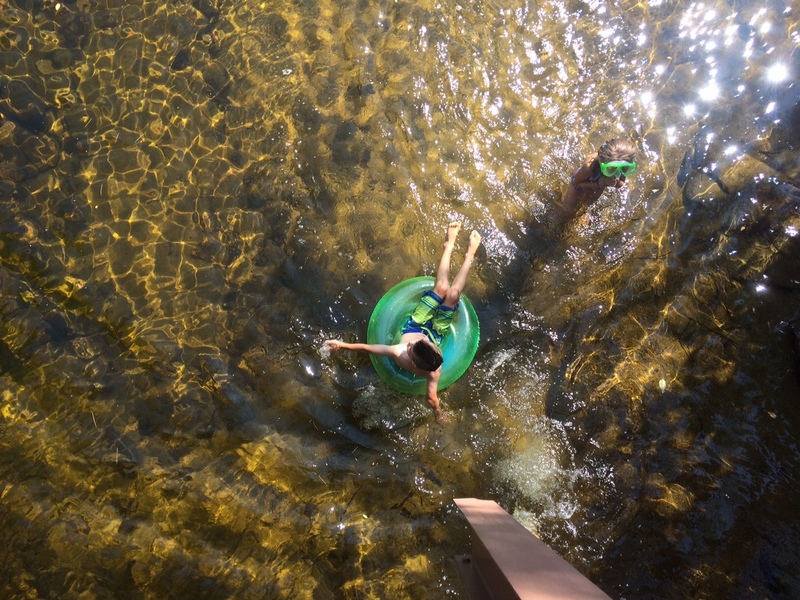 There’s a swimming hole down the road I’ve visited since I was a child, where I return now with kids and dog on the hottest, muggiest days – or just when we need something easy to do away from the house. It’s not the deepest or the most beautiful, and it’s certainly no secret. But it’s conveniently close to home, and it offers endless cool fun on the long, hot dog days of summer. My brothers and I splashed in this same spot when we were kids. For us, who came to the mountains mainly during winter, the river was a summer wonder. We were used to crossing the small bridge spanning the Ham Branch when its current was concealed in thick layers of snow and ice, a mere silvery sliver of moving water visible through all that white. Sometimes, though, we found our way north in the summer. On hot days we’d make the short trek down from the house to find the river transformed in its summer color. We built dams and watched tiny fish swim through the water, threw rocks just to see the splashes they’d create. All things kids at rivers have probably always done. Things my kids at this river do now. Some days we come to the swimming hole prepared with towels and snacks and snorkeling masks for peering through the moving water to see what’s below the surface. Often there are cars parked along both sides of the road, with sunbathers, splashers, and swimmers strewn upstream and down. Sometimes we have the spot all to ourselves. The best swimming is right below the grated metal bridge, which hums with the occasional passing rumble of car or pickup truck tires. We wander the rocky river islands seeking flat stones for skimming and throw sticks into the deepest water for the dog, who prefers the crispness of winter to the heat and biting bugs of summer. I think swimming is summer’s sole redemption in the dog’s mind. The spot where my brothers and I used to pile rocks as big as we could carry in a futile attempt to alter the water’s flow is a bit wider now than it was 30 years ago. But someone – or, likely, a series of someones – has extended the dam. Rocks are added and removed probably with each visitor. My children consult with each other as they work on their own renovations to the dam, placing fist-sized stones in the larger breaches, handfuls of pebbles to fill the gaps between, sand and clay to cover it all until the next rain and rising current. The river flows through anyway, a comforting gurgle of water moving easily downstream. Other times our swimming hole outings are brief. We stop by on the way home for a quick dip, or run down after dinner to cool off before bedtime. On one such evening venture a couple of years ago, as we stood with our toes in the water, my brother and sister-in-law came floating down the river in inner tubes, along with a pair of friends and a cooler (in its very own tube) ferrying refreshments. Cool rivers on hot nights are not just for kids and dogs, after all. I’ve visited other swimming holes, of course. There’s one a bit further upstream where we happily slip and slide down gentle, flowing waterfalls, like river otters playing in the waves along the worn-smooth boulders. We sometimes go south to the Pemi, finding cool pockets of water pooled in smooth rock basins carved deep by eons of flowing water. We have found bullfrogs and thousands of tadpoles swimming in shallow concavities near the edge of the Pemi and huge, juicy blackberries nearby. I have dipped into the deep, perfect pool at the base of Bridal Veil Falls, a sweet reward for a not-too-strenuous hike. One summer during college I leapt from cliff ledges along some Vermont river into the cool expanse below. I have waded into the almost unbearable chill of high alpine lakes in Colorado, enveloped in solitude and impossible beauty. I am, like most of us probably, part intrepid explorer and part contented homebody. I love to wander to new places and experiences. But often I find myself returning to the familiar, to the places of my good memories. Places like my old standby swimming hole. It’s not the most scenic or secret or secluded. But it’s a darned good place to be on a hot summer day. Original content by Meghan McCarthy McPhaul, posted to her Blog: Writings From a Full Life. This essay also appears as Meghan's Close to Home column in the July 24, 2015 edition of the Littleton Record. My watch broke the second week of my first summer in Ireland. Somehow I survived the initial panic of not being able to tell the time with a quick glance at my wrist and adjusted to scanning the city landscape for one of the many clock faces towering above the streets – on churches, government buildings, and in the ivy-ensconced courtyard of the university I was attending. 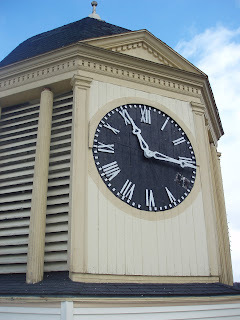 The Dow clock in 2012, before its facelift. That was in 1995, and I haven’t worn a watch since. My innate need to be always on time has remained (sometimes aggravatingly) intact, which is, perhaps, unsurprising considering the sheer number of clocks in the world. My phone serves as alarm clock, stopwatch, and timer. My car has a clock, as do the kitchen stove, the microwave, the DVD player, and my computer screen. Surrounded by the bright, blocky numbers of digital clocks, I prefer old fashioned timepieces, which contain much more character – and, perhaps ironically, a sense of timelessness. We are lucky in Franconia to have one of these in the center of town, smack dab between Main Street and the mountains that define our southern horizon. 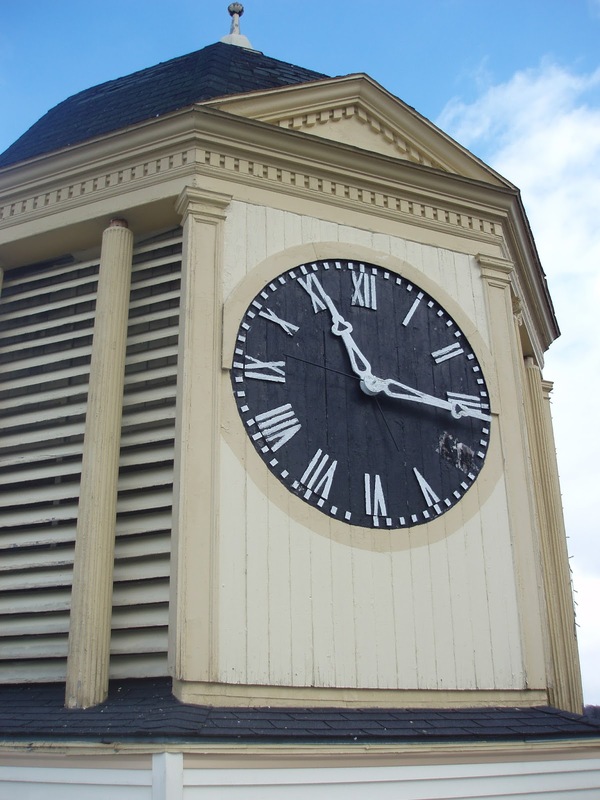 The clock on the former Dow Academy building, which has told time for the community since 1903, has recently resumed its chiming after a hiatus of a couple of years. When the wind is drifting the right way, I can hear the old clock bell tolling even at my home, two miles away. The resonating clang reaches me while I am at my desk or in the yard, sometimes causing me to pause and consider what needs to be done at this hour. On summer nights the echoed chiming floats with the breeze through the open window as I read, serving as a not entirely welcome reminder that it’s time to put the book down and turn off the light. In the early mornings, when I linger in half-sleep, the clock’s bell mingles with the distant fluting of the wood thrush from the edge of the forest, the singsong conversations of robins in the yard, and the relentlessly repeated cackle-call of some bird I have not yet identified. Hearing the ringing of the Dow clock again has made me realize that I missed its sound in the silent interval while the clock was being repaired and restored. When my children were very young, we made regular forays to the playground in Franconia, where the clock tower stands like a stalwart friend above the swing set and twisting green slides. I became used to marking the time with an upward glance at the clock. How long until lunch? Or naptime? Or a meeting with friends? Now the children play t-ball and baseball and soccer on the adjacent fields, and I had missed the convenience of telling the time from the large hands and Roman numerals of the Dow clock. I’m happy now for both the return of that convenience and the tolling of each hour, which is somehow reassuring: time marches on, no matter the weather, the activity, the day’s challenges. When I wore a watch – a habit I picked up when Swatch watches were all the rage and continued until that fateful day in the west of Ireland – I looked at it often, especially if I was running late. The closer I was to the time I was supposed to be somewhere, the shorter the interval between glances. It was maddening. My son, who is 8, has inherited this need to be on time. Actually, we both prefer to be five minutes early whenever possible. On school days, he looks often at the digital clock over the stove in the kitchen, counting down the minutes until we have to leave the house, impatiently imploring his sisters to finish breakfast and reminding me how much time I have to complete the morning chores. In the car, on the way to games or appointments or dates with friends, he watches the clock, remembering to subtract four minutes from the time displayed because that clock runs fast. It’s probably a good thing, then, that it was not my time-fixated son, but his twin sister who received a watch as a gift from their grandmother this summer. It is this child of mine, the one who is much less concerned about what time it is and hardly ever considers the potential ramifications of being late, who has become our family’s official teller of time lately. Her watch is purple and pink and green, its band bedecked with daisies, the analog numbers multi-colored, and the seconds marked by the ticking of a flower. Telling time is a skill my daughter is still developing. Sometimes when I ask her what time it is, she gives me an answer that is so far off I can tell she has mixed up the minute and hour hands, or become distracted by that ticking flower. Other times she is spot on. Either way, after so many watch-less years, I’ve developed a pretty good sense of what time it is. I know we’ll get to wherever we’re going when we get there. Still, I often can’t help racing the clock, even if it’s no longer on my wrist. Chances are, wherever we’re going, we’ll be early. Original content by Meghan McCarthy McPhaul, posted to her Blog: Writings From a Full Life. This essay also appears as Meghan's Close to Home column in the July 10, 2015 edition of the Littleton Record.